I was showing these venerable strip cartoon characters to the congregation as part of my talk on Remembrance Sunday in 2014. Afterwards, a lady who had been born in 1918 told me that was the popular name for the three basic medals given to those who had served in the war. As I write this I am looking at them in their small frame. The central one is the war medal, with the head of King George V on the front. To the right is a gold medal inscribed, “The Great War for Civilisation 1914-1919”. The final one on the left is the poignant one. It is star-shaped, with 1914-15 on the front. On the back is the name of my great uncle, who “died of wounds” in Gallipoli. 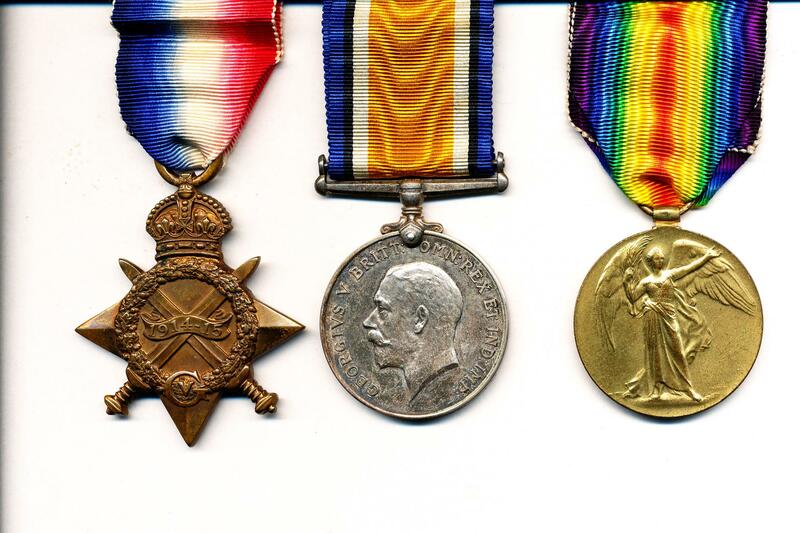 These three medals were given to his parents after the war. I wonder how they felt? How long did they keep them on display? I imagine they were given to my father because he was named after his uncle. Now I ponder over them 103 years after this unknown relative’s death. Better than nothing? A constant reminder? Pride in a son’s sacrifice? A badge of honour for the family – “We lost someone as well”? In many ways Christianity took a hammering in WW1. Two self- styled Christian nations both with clerics claiming that God was on their side! Remembrance of sacrifice – with thanksgiving and gratitude.